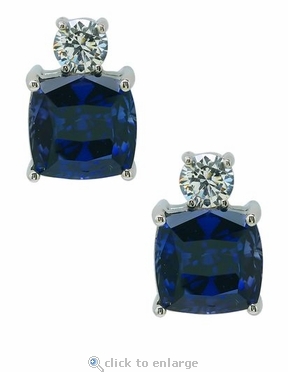 The Kyra 4 Carat Sapphire Blue Cushion Cut and Round Stud Earrings feature our very popular cushion cut lab created laboratory grown man made cubic zirconia. The cushion cut is further accented with a round basket set cubic zirconia set on top. 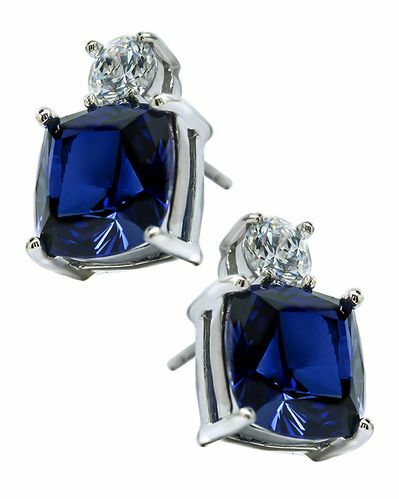 These earrings include approximately 8.75 carats in total carat weight of the finest original Russian formula cubic zirconia that is hand cut and hand polished. Further customize your earrings with your choice of standard push backs or large backs that provide added security and comfort. Please see the pull down menu for options. For further assistance, please contact us directly at 1-866-942-6663 or visit us via live chat and speak with a knowledgeable representative.